What a wonderful evening Mike and I had last night. We met about 6:30 at the Goatfeathers access and made the little walk over to the nest. The sun was in perfect position and the temperature was perfect. Mike dug the nest and found 7 little ones ready to get out and make their way. We had a visitor, Gladys who had been watching the nest for a while and was so sweet and appreciative of the experience to get to see us dig the nest. 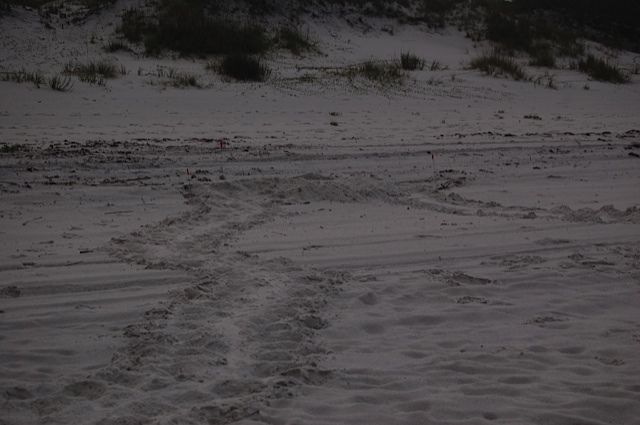 When we finished, and picked up all the stuff from the nest and buried the eggs, we moved down the beach a little to a flat area. It was perfect timing. We released the 7 little hatchlings and they made their first steps pretty quickly to the gulf…of course the surf pushed them back a few times, but then they got a little momentum and took off. It was a wonderful sight and went without a hitch. Mike did a great job and what a great season for him to find 4 nests!